Left turn on arrow only. Regulation signs regulate traffic speed and movement, displaying rules which drivers must obey. 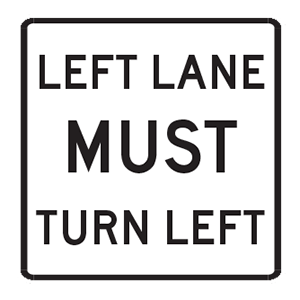 This regulation sign tells traffic in the left lane that they must turn left. Warning signs prepare drivers for upcoming road conditions and hazards and are usually yellow with black markings. 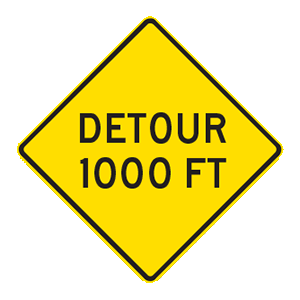 This sign informs drivers that they will be approaching a detour in 1,000 feet.